Following Bellator 218 held this past weekend in Thackerville, OK, the promotion announced its next visit to the town scheduled for July 13 (AEDT). MMA event on Paramount Network and DAZN is headlined by the defending women’s featherweight champion Julia Budd up against Olga Rubin. 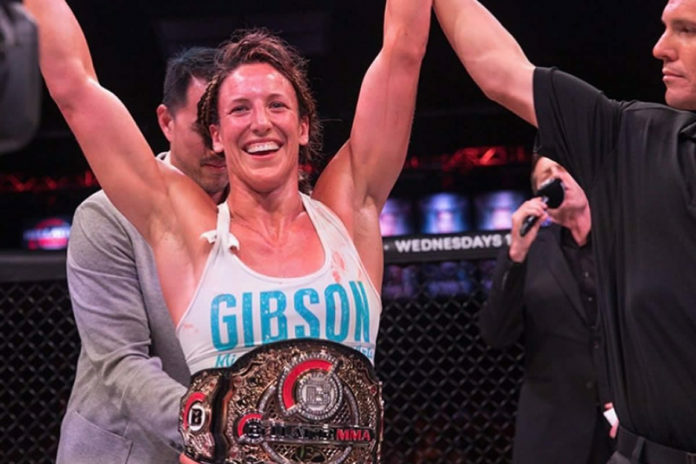 “Fighting out of Port Moody, British Columbia, Canada, Budd is set to enter the Bellator cage for the first time in 2019 and for the third time since claiming the inaugural Bellator women’s featherweight world title in 2017. Currently riding a winning streak of 10 bouts, including six straight since joining forces with Bellator in 2015, “The Jewel” has her eyes set on a third consecutive world title defense when she challenges the undefeated Rubin,” reads the announcement sent out on Tuesday. Julia Budd (12-2) earned the inaugural Bellator Women’s Featherweight title in March 2017 when she stopped Marloes Coenen in the fourth round with punches. She made her first successful title defense in December the same year taking a split decision against Arlene Blencowe. In her second championship defense last July “The Jewel” retained the belt via the third-round TKO win against Talita Nogueira. Olga Rubin (6-0) is coming of a unanimous decision win scored against Iony Razafiarison in February. Last November she similarly defeated Cindy Dandois. A year earlier “Big Bad” stopped Joana Filipa Magalhaes in the second round with punches.